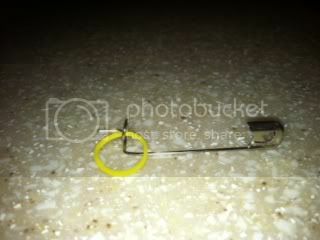 Another Mouse Trap (Arrow Holder) Added Step By Step Instructions. I've been thinking about a better way to make an arrow holder for when I'm on stand. 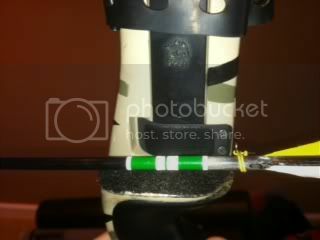 I like the idea of the rubber band and pin but I didn't like the idea of drilling a hole in my bow. 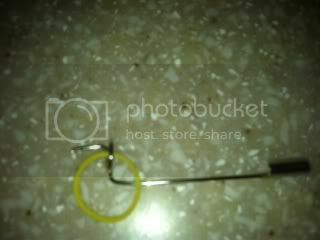 I got the idea today to try an ordinary safety pin. 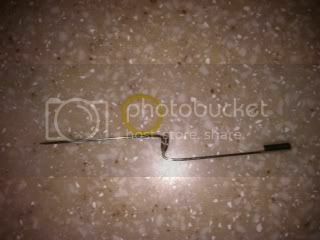 I cut off the sharp end and bent it straight. 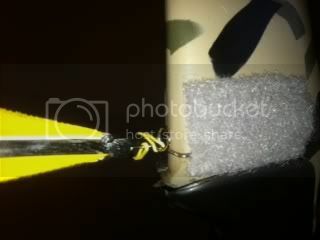 I then bent the loop to conform with the bow and taped it to the side of my bow with velcro. 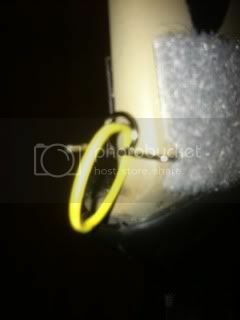 The loop holds the rubber band to use over and over and the band slips nicely off the pin when drawn. Simple, Neat, and Cheap. A world of opportunities awaits upwind but nothing waits downwind. 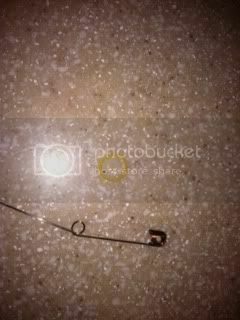 Re: Another Mouse Trap (Arrow Holder) Added Step By Step Instructions. Nice! I don,t need it, but realy nice!! For years I used a popsicle stick and two rubber bands. One to hold the stick on the bow, the other to hold the arrow. 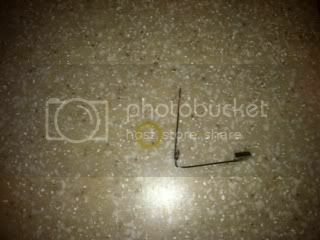 I used a dowel once, with the contour of the riser shaped in into the dowel. I used double sticky foam tape to attach dowel to the riser. 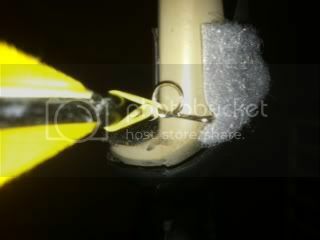 The rubber band was attached at the "back side" of the riser end of the dowel.The rubber band was then streched over the arrow to the dowel on the "belly side" of the dowel. It isn't clear to me how the rubber band comes off the arrow while drawing the arrow on your set up. I do like the simplicty of the holder though. ... When thru the forest glades I wander and hear the birds sing sweetly in the trees, when I look down from lofty mountain grandeur and hear the brook and feel the gentle breeze, ...How great Thou art! The rubber band goes around the shaft and reconnects to the short pin pointing to the rear. Pops off the arrow as soon as you start to draw. 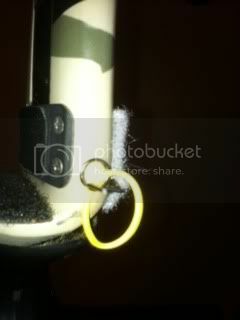 Very nice, maybe a small piece of felt or velcro on belly side of window to protect the wire loop from clicking on the riser. I haven't had any clicking the way it is but a little velcro just in case never hurts. They don't work well for me with skinny arrows. I've lost several arrows on stand with those things. These just work better for my way of doing it. Plus I have 12 bows. For $3 bucks I have a lifetime supply of pins and bands. 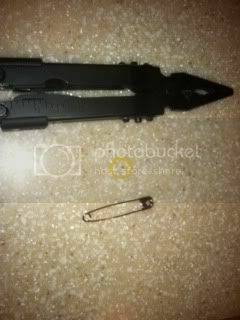 Now I see the pin in photo #5 ! Now I looking for a safteypin. Gota have one somewhere. What size did you use? I like it, will be making some tommorow. I think about any size will work. The pack I have are 2 in. Good Luck. I made up 12. One for every bow. 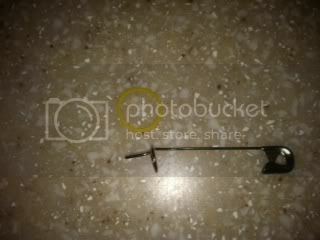 Would you mind showing a photo of one finished ready to mount on the bow? I'll post a sequence of pics showing every bend to make the final product. Finished and ready to tape on bow. Pretty clever I'd have to say! Most people get rich by making more money than they have needs, me, I just reduced my needs! Even a blind squirrel finds a nut every once in a while. I shot a bunch yesterday and I'm really liking this arrow holder. Simple, Easy, and Cheap.